Located only about 160 000 light years from us (eso1311) in the constellation of Dorado (The Swordfish), the Large Magellanic Cloud is one of our closest galactic neighbours. It is actively forming new stars in regions that are so bright that some can even be seen from Earth with the naked eye, such as the Tarantula Nebula (eso1033). This new image, taken by ESO’s Very Large Telescope at the Paranal Observatory in Chile, explores an area called NGC 2035 (right), sometimes nicknamed the Dragon’s Head Nebula. NGC 2035 is an HII region, or emission nebula, consisting of clouds of gas that glow due to the energetic radiation given off by young stars. This radiation strips electrons from atoms within the gas, which eventually recombine with other atoms and release light. Mixed in with the gas are dark clumps of dust that absorb rather than emit light, creating weaving lanes and dark shapes across the nebula. 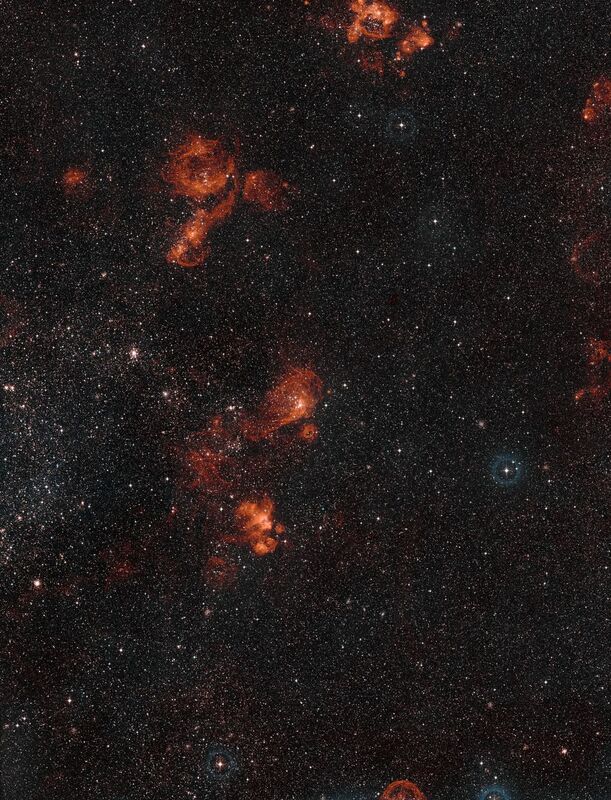 The filamentary shapes to the left in the image are the not the results of starbirth, but rather stellar death. It was created by one of the most violent events that can happen in the Universe, a supernova explosion. These explosions are so bright that they often briefly outshine their entire host galaxy, before fading from view over several weeks or months (also see eso1315 and potw1323a). From looking at this image, it may be difficult to grasp the sheer size of these clouds, they are several hundred light-years across. And they are not in our galaxy, but far beyond. The Large Magellanic Cloud is enormous, but when compared to our own galaxy it is very modest in extent, spanning just 14 000 light-years, about ten times smaller than the Milky Way. 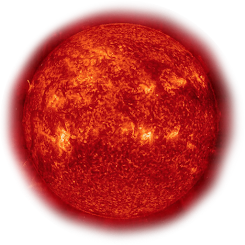 This image was acquired using the FOcal Reducer and low dispersion Spectrograph instrument attached to ESO’s Very Large Telescope, which is located at the Paranal Observatory in Chile, as part of the ESO Cosmic Gems programme.